Bubba Watson proved his first Masters win was no fluke with a mature and at times majestic performance to clinch a second Green Jacket in three years. The quirky left-hander with the wild swing has never had a lesson and plays what he calls "Bubba golf", a freewheeling brand of the game where he uses his imagination, talent and a sense of bravado to get around the course. Watson curves the ball at will, producing huge banana slices with that pink driver and hooks with his irons. His lanky frame and aggressive swing enable him to hit the ball prodigious distances. When his putter is on form, it is a potent combination. 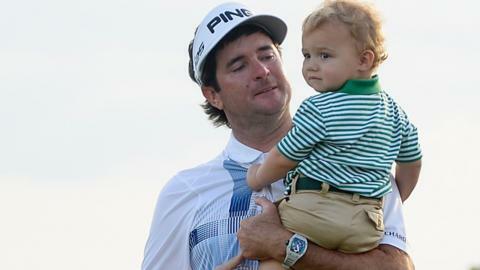 "It was a fabulous effort from Bubba Watson and he finishes with a 69. The course has played difficult all day and in the back nine he was behind by quite a bit, but played good shot after good shot. He showed a lot of fortitude and was too strong mentally. "Once Jordan Spieth opened the door, Bubba walked right through it. You don't win the Masters once by accident; twice means you can play. It puts him in a totally different echelon in the game." Two years ago¸ Watson conjured a spectacular hooked wedge from the woods to beat Louis Oosthuizen in a play-off at Augusta. But this was Bubba golf mark II, featuring the same individual action with a slightly more refined approach. Watson preached a mantra of just trying to hit greens this week. And he admitted to sometimes even asking his caddie Ted Scott what the smart play was. Not that he always took the advice. He ignited his challenge with a streak of five straight birdies to hit the front on Friday and held on to a share of the lead after a shaky Saturday with the putter. Even so, after his three-shot victory over fellow American Jordan Spieth and Sweden's Jonas Blixt, Scott described Watson's style as a "freak show". Hardest hole: The par-four 11th took an average of 4.5 strokes to complete. Only 10 of the 874 birdies this week were snatched from the hole named White Dogwood. Easiest hole: The four par fives were the easiest hole statistically all week, none more so than 13. Named Azalea for its decorative shrubbery, players felt right at home, averaging 4.7 strokes. Longest driver: Bubba Watson - averaged 305.62 yards. Best putter (four rounds): Rickie Fowler - average 1.5 putts per hole. Most greens in regulation: Jordan Spieth - hit 53 of 72 (73.61%). "I asked him on 18, after he hit the tee shot: 'Are you from Mars or something, because I don't believe that you can hit these shots that you hit,'" said Scott. But if the Augusta Green Jackets were choking on their mint juleps at the thought of Watson driving up Magnolia Lane in his Dukes of Hazzard car after the first win, they know now they have a bona fide superstar in their club. Gerry Lester Watson - Bubba is a lifelong nickname - joins illustrious names such as Ben Hogan, Byron Nelson, Tom Watson and Seve Ballesteros as a two-time Masters champion. "It's overwhelming... to be with the great names - just a small-town guy named Bubba now has two Green Jackets - it's pretty wild," said Watson, who hails from Bagdad in the Florida Panhandle. The 35-year-old is an emotional character, prone to crying, and claims to suffer from attention deficit disorder. A fun-loving personality, he admits he has "issues". "There's a naive innocence about him which, in this day and age, is quite loveable," said BBC commentator Peter Alliss. Watson struggled in the year after his first Masters win, but admitted he was suffering from a hangover - not alcoholic, as a devout Christian he has never been drunk - but because of the magnitude of his achievement. "You've got to think about where I've come from - my mom having two jobs to pay for my golf, my dad working in construction," he said. Watson and his wife Angie had also just adopted a baby boy before the 2012 Masters and his time after that was spent adjusting to family life and growing up himself. He found it hard to cope with the extra demands on him as defending champion last year and finished tied 50th, perhaps fuelling the school of thought he was a one-hit wonder. But with his team, Watson refocused and got back down to working hard on his game. He won his first title since 2012 earlier this season and came to Augusta in determined mood. "You know, I do everything my way," he said. "I learned the game my way. I figured it out my way. So it just takes me a little bit longer with the mental focus and drive to get back to where I am today." Former US Ryder Cup captain Paul Azinger, working as an analyst for the BBC at Augusta, said: "He's such an imaginative, clever player, a raw, natural talent. Almost a genius, but genius looks a lot like hard work to me. He doesn't mess around." Watson may be unorthodox, but his violent swish is a refreshing antidote to the robotic and over-analysed swings that proliferate the professional game. Many observers say Tiger Woods has become mired in the technicalities where once he played by instinct. It was not until the 67th Masters, in 2003, that the first left-hander got to wear the Green Jacket - Canada's Mike Weir. Phil Mickelson (2004, 2006, 2010) and Bubba Watson (2012, 2014) makes it six of the last 12 champions who have been left-handed. "You have to play your swing," said Watson. "That's what I'd tell anybody - I do what it takes to make the score. I don't care how pretty it is; I don't care if it's ugly; I don't care if it's out of the woods. I just want to make a score. Lucky for me, I've done it a couple times around this place." Azinger added: "There needs to be a convergence between the artist and the engineer. Bubba doesn't need to know it all to be great." Watson, though, plays down his place in history. "I'm just trying to keep my Tour card every year and if people say that I'm a good player, that's great," he said. "But I'm not trying to play golf for everybody to tell me how great I am. "I play golf because I love it. I love the game; I want to grow the game. The game has brought me everything that I've ever owned in my life." That includes two Green Jackets and a place in Masters legend.